[Tip] Collaborating on Github [Tip] Collaborating on Github | Hello Blog! 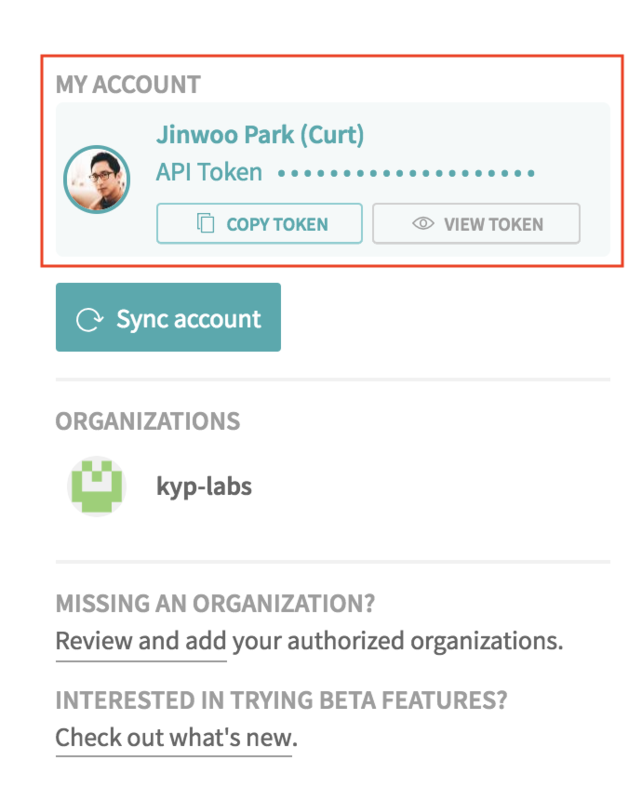 This documentation will be working as a simple guidance to make a full consensus for collaboration on further projects by KYP-Labs. All contents aim to simply deliver ‘how-to’ rather than ‘why’, which is sufficiently well-described in the referenced pages. Later on, new topics will possibly be added on the fly if needed. Separate subject from body with a blank line: Sometimes a single line is fine when it comes to a very simple change that people can fully understand without difficulties. Limit the subject line to 50 characters: Proper length of title ensures that it is readable. GitHub’s UI is fully aware of these conventions, so it will warn you if you go over the 50 character limit; any subject line longer than 72 characters will be truncated. Use the imperative mood: Git itself uses the imperative whenever it creates a commit on your behalf, so using the imperative can make a consistent tone. Wrap the body at 72 characters: The reason for wrapping your description lines at the 72nd mark is that git log adds a padding of 4 blank spaces when displaying the commit message. As a lot of people use terminals 80 characters wide, and commit messages are often shown with 4 spaces indentation (add another 4 for the same margin on the right side), 72 is an ideal length. Use the body to explain what and why vs. how: In most cases, you can leave out details about how a change has been made. Code is generally self-explanatory in this regard (and if the code is so complex that it needs to be explained in prose, that’s what source comments are for). Tip. Add this line to your ~/.vimrc to add spell checking and automatic wrapping at the recommended 72 columns to you commit messages. Note that the default gitcommit.vim syntax file already stops highlighting the first line after 50 characters. Use feature branches for all new features and bug fixes. 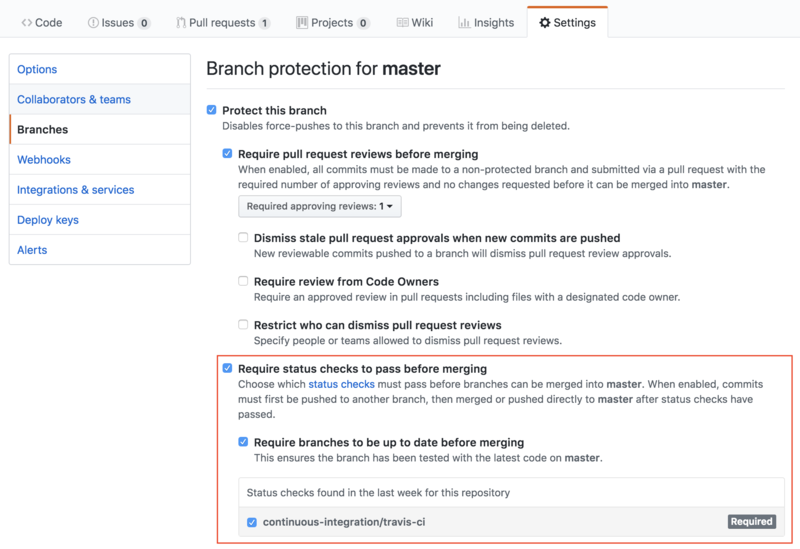 Merge feature branches into the master branch using pull requests. Keep a high quality, up-to-date master branch. 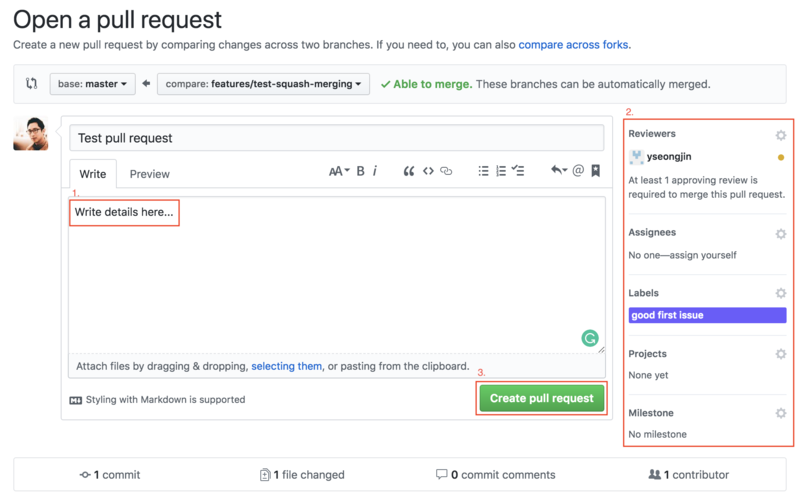 A strategy that extends these concepts and avoids contradictions will result in a version control workflow for your team that is consistent and easy to follow. Develop your features and fix bugs in feature branches (also known as topic branches) based off your master branch. Feature branches isolate work in progress from the completed work in the master branch. 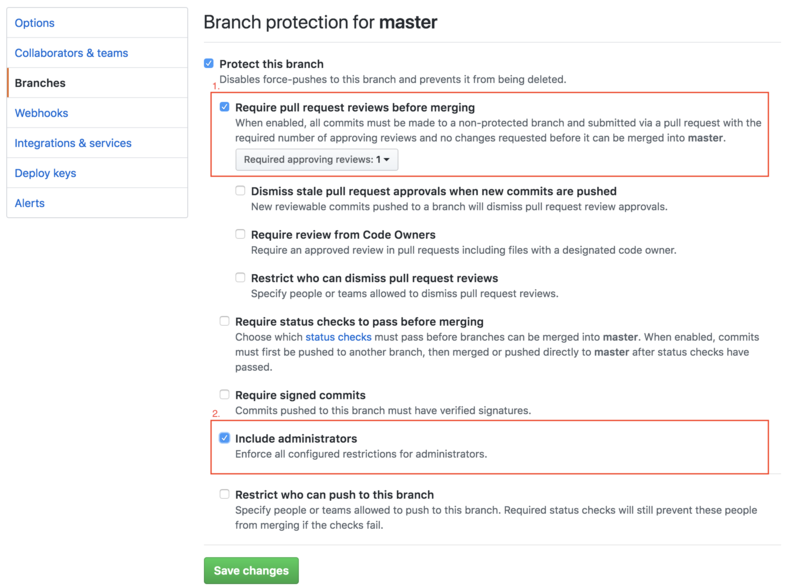 Git branches are inexpensive to create and maintain, so even small fixes and changes should have their own feature branch. One thing to note is that you should create another feature branch, which is called user or personal branch, if you are not working alone on the feature branch. In that case, the user branch will be merged into the feature branch via pull request. Use a consistent naming convention for your feature branches to identify the work done in the branch. You can also include other information in the branch name, such as who created the branch. 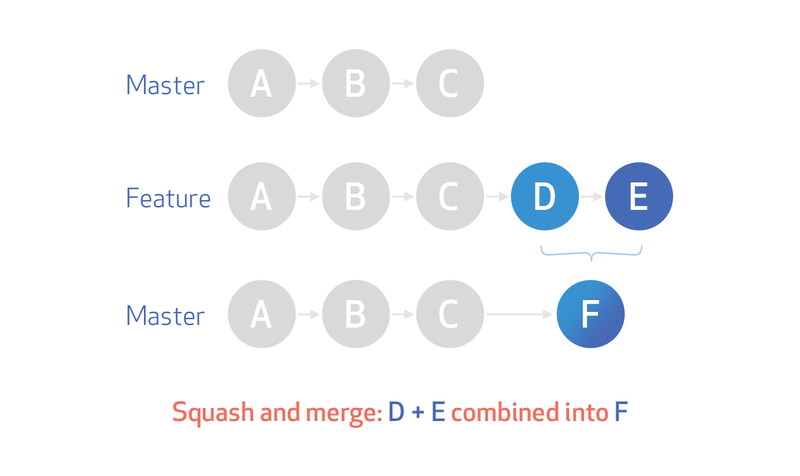 git commit -m "Test squash merging"
Tip. If you don’t want to allow non-squash commits merged, deactivate the following checkbox in ‘Settings’. 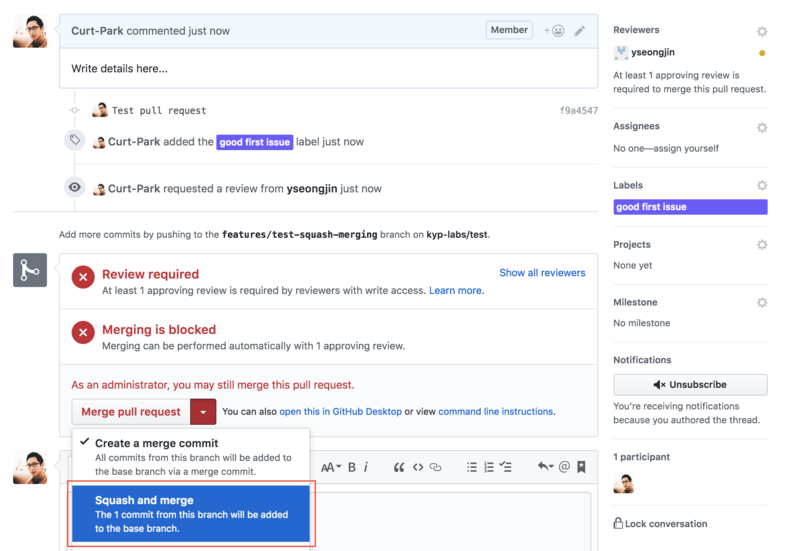 Require pull request reviews before merging: If this setting is activated, code review via pull request becomes mandatory in order to merge your commits into the remote branch; it means you cannot push your commits directly. Include administrators: You need to activate this setting if you want to enforce all configured restrictions for administrators as well. Test automation is a critical part for Continuous integration; you can make your project more stable and efficient by automating all repetitive tests neccessarily conducted for every commit or pull request. Here, I use Travis CI which provides a variety of features for test automation, requiring just little effort. It works really well with GitHub. By the following steps, you can easily make tests run for every single change on your repository. The token can be obtained from your profile page in Travis CI. There are plenty of choice for Python static analysis tools. My team go for flake8 offering both static analysis and style checks against PEP8. Recently, flake8 is widely used for many open source projects because it is so fast and easy to use. 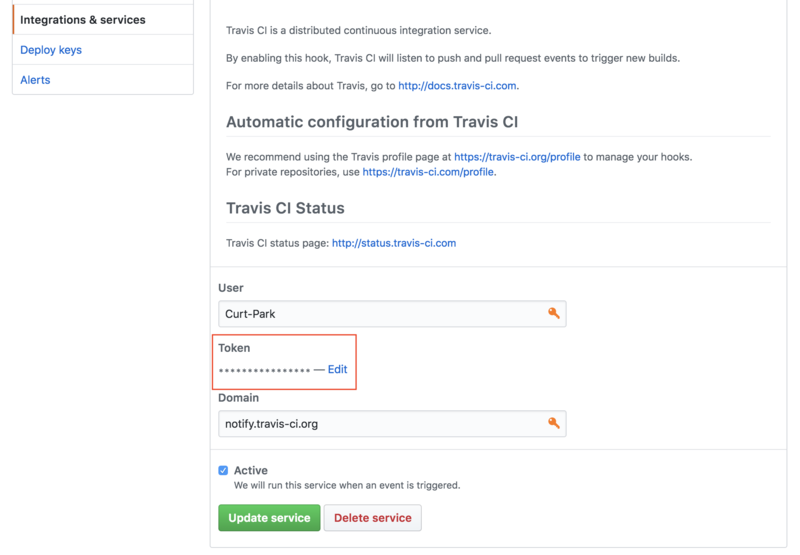 Note that You can see more examples from Travis CI user documentation. As for pytest, see the official guide. Step5. See if all tests run well. Chris, B. (2013). How to Write a Git Commit Message. [Online] Available at: https://chris.beams.io/posts/git-commit/ [Accessed 3 June 2018]. Rachel, P. (2015). What’s with the 50/72 rule?. [Online] Available at: https://medium.com/@preslavrachev/what-s-with-the-50-72-rule-8a906f61f09c [Accessed 3 June 2018]. GMTA. (2014). Why do a lot of developers apply a 72-character line limit to their commit messages? Why not let software handle wrapping?. Available at: https://www.reddit.com/r/git/comments/20ko8g/why_do_a_lot_of_developers_apply_a_72character/ [Accessed 3 June 2018]. Thompson, C. (2013). 5 Useful Tips For A Better Commit Message. [Online] Available at: https://robots.thoughtbot.com/5-useful-tips-for-a-better-commit-message [Accessed 3 June 2018]. Tournoij, M. (2017). Limit subject line of git commit message to 50 characters. [Online] Available at: https://stackoverflow.com/questions/43929991/limit-subject-line-of-git-commit-message-to-50-characters [Accessed 3 June 2018]. Visual Studio Team Service. (2018). 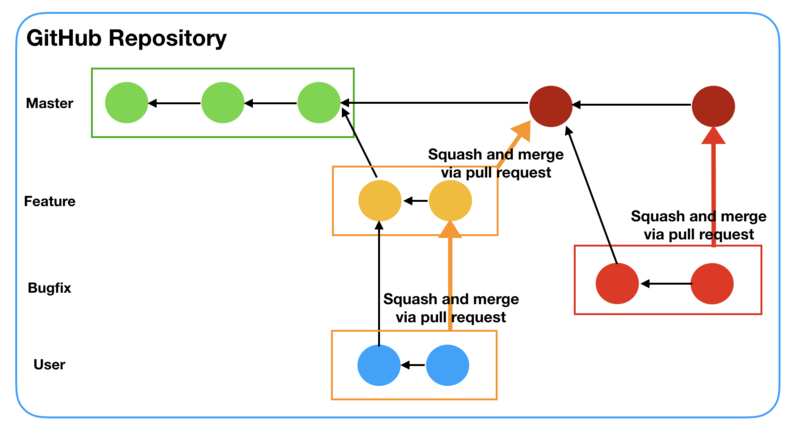 Adopt a Git branching strategy. [Online] Available at: https://docs.microsoft.com/en-us/vsts/git/concepts/git-branching-guidance [Accessed 3 June 2018]. The GitHub Blog. (2016). Squash your commits. [Online] Available at: https://blog.github.com/2016-04-01-squash-your-commits/ [Accessed 3 June 2018]. Codacy. (2016). Review of Python Static Analysis Tools. [Online] Available at: https://blog.codacy.com/review-of-python-static-analysis-tools-ff8e7e27f972 [Accessed 4 June 2018]. mzfr98. (2018). Any advantages of Flake8 over PyLint?. [Online] Available at: https://www.reddit.com/r/Python/comments/82hgzm/any_advantages_of_flake8_over_pylint/ [Accessed 4 June 2018]. Travis CI. (2018). Building a Python Project. [Online] Available at: https://docs.travis-ci.com/user/languages/python/ [Accessed 4 June 2018]. pytest. (2018). Installation and Getting Started. [Online] Available at: https://docs.pytest.org/en/latest/getting-started.html [Accessed 4 June 2018].